Better than the revision effort imo :). A tad "generic" but still excellent music, and I really liked the fisheye projections. Obvious winner. By the way the ftp download asks for authentication..? Oh that was very enjoyable. Very stylish and definitely agree with what break said. This was pretty dope. The gas effects in the beginning was really ninja! The textures look low res. Maybe it's because of youtube's compression or the post processing. Very nice music and overall design / look. pretty damn cool if you'd ask me! Great flow, loved the cloud/galaxy scene! Nice fisheye, superb textures, wellmade transitions, kewl effects and an ace soundtrack! rulez added on the 2014-10-13 12:21:05 by ɧ4ɾɗվ. visuals, pace and mood match perfectly. the post processing on the scenes make them look like professional video rendering. here running in realtime. scenes are great and it even shows some fancy tech like the smoke simulation. great job guys, really love this new cocoon style! Wow. Top-notch WebGL demo! Great track and flow. yet another awesome cocoon demo. raer: It's not WebGL, it's Win32/DX11. keep up the new design clip. This is how you do it. My only gripe is that "greetings part in middle of the demo" which usually does not work at all. Smooth ride. I LOVE the opening scene, and I love some of the transitions (and the fact that there are transitions at all :-))! The other scenes look gorgeous too, and music is awesome. 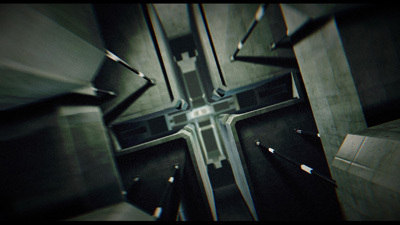 The downsides for me are that sci-fi/industrial scenes (the "tunnel") are sooo boring by now, and that the demo as a whole is random and goes nowhere. But I enjoyed it nonetheless! What ps said. One of my favorite Cocoon demos so far. Really nice demo, excellent music, nice color schemes and effects. Very enjoyable! This is probably my favorite Cocoon demo too. Killer looking smoke effects, really nice transitions and overall the neat atmosphere. It's a damn good demo! I really liked the flyby through the irregular tunnel backwards. Yet another quality demo in the production line of Cocoon. Really nice. I really loved the music and direction. The glow in the cube smoke was rather lovely to look at too. Very solid and good demo. I was a bit bored after a while and I had the feeling that the lighting isn't very plausible. Not really necessarily important for demos... but maybe that's something AAA demoscene groups like cocoon could have a look at ;). I can't get the point on demanding this on JS/webGL: at this framerate & resolution? Yes,...we can wait 5 years to get more powerful CPU and GPU, and a more stable&efficient (if efficient applies to this need) Angle+webgl+JS thing and get a super useful on-line exact-version of this demo. Very slick production. Absolutely high quality but not over-complicated. Love the music. MSVCP120.dll missing from system. System runs Steam and games. Awaiting final. These arent the droids we are looking for.. This is really nice and I love the soundtrack. That was 5 enjoyable minutes. Great pacing. Hmm, this one felt a bit strange. Everything looks good, with the exception of that silly surveillance camera. However, it doesn't grab my attention at all and the soundtrack does very little to add to the experience. One of the few cases where I'm willing to consider that it's me there's something wrong with and not the demo.. Piggie it is then. sleek visuals and music with character! also for those with the 'MSVCP120.dll missing' problem installing this fixes the problem (worked for me as well). Very nice design and direction. the smoke cube at the beginning was a bit disconnected (and seen way too often), the rest was the usual good flyby (or "archviz", as it is called now). Smoke sphere thing at the end was awesome. Also, do cocoon demos get brighter every time in very small steps or is it me? Very nice :) The backwards flying "tunnel" maybe a bit too static. This is rock solid design, I enjoyed it a lot. music was slightly too trancy and too edm-ish fo me. Unfortunately, my laptop is simply too slow to run the demo at anything more than slideshow rates. Still, judging from the video, it's a solid production. Great except one thing: please stop doing cross fades between scenes - Navis said it once, it ruins the flow when watching in realtime due to performance drop due to two scenes being rendered at once. Very nice mood, very nice effects. Good stuff in here, needs some work on the typography / design though. ultra slick, super smooth - my taste! Nice demo with some good effects (mainly smoke) and design/music style different than usual. Cool design and music, good code! Wow. I'm really so, but I can't give you a thumb up because my judgement is clouded by envy of your lighting. Awesome stuff. The only detail that didn't please my eye was the RGB-split on the type in the final scene. I have to watch this couple of times to see all the details. Perfect pace and super nice architectural structures. I need to put these screenspace reflections on my wishlist, too. music suits well the visuals that are not overfilled with stuff, leaves a great afterglow after watching. thank you very much! Excellent! Any download of the soundtrack available? Great visuals, music and atmosphere! But I think the typography and overlays don't fit that well and could need more style. Decent on YouTube (XP Pro SP3 unsupported :P). Incredibly well done in every aspect. Wanting to nitpick, I'd probably have left out the only non-abstract element from it: the camera. Still, top stuff. quite nice. and different from your previous prods, which is a yay. Really good fit between visuals and musics, good ambiance, solid! awesome. i think smoke box is an innovation. Very nice, I like the cloud/smog scenes. The music is good as well. Well that's going on the playlist of awesome demos I love and want to show other people who know nothing about the demoscene! really nice and whatch Preacher said! This is what a demo should be : Stunning. Lights, shadows, music, atmosphere.. It is great! Damn smooth mixdown on the soundtrack, great overall mood too. Subtle noise on visuals ftw! i enjoy the first 1:30mins especially! woohhooo! Awesome music and visuals wow. The highly-skilled members of Cocoon give us a raw demonstration of what jawdropping code, superb design and a top-quality soundtrack can do. These elements are masterfully weaved together as this majestic demo gradually builds up tension and atmosphere until the hapless audience find themselves enveloped within the concrete walls of an unseizable world. Wow ! Especially the first half of the demo . Missed this one somehow. Very nice music, direction and effects! loved it. one of my fav cocoon prod. love the soundtrack & direction. To date, this is still my favorite Cocoon demo. page created in 0.025279 seconds with 15 queries.